If you haven’t been to the Pleasant Praire Premium Outlets of Kenosha this Spring yet, make sure to make a trip there! Last weekend I went to the one closest to us in Kenosha, Wisconsin, and it was so worth it! My hubby stayed with the kids (thanks, Jay!) and I told him not to wait for me, ha! 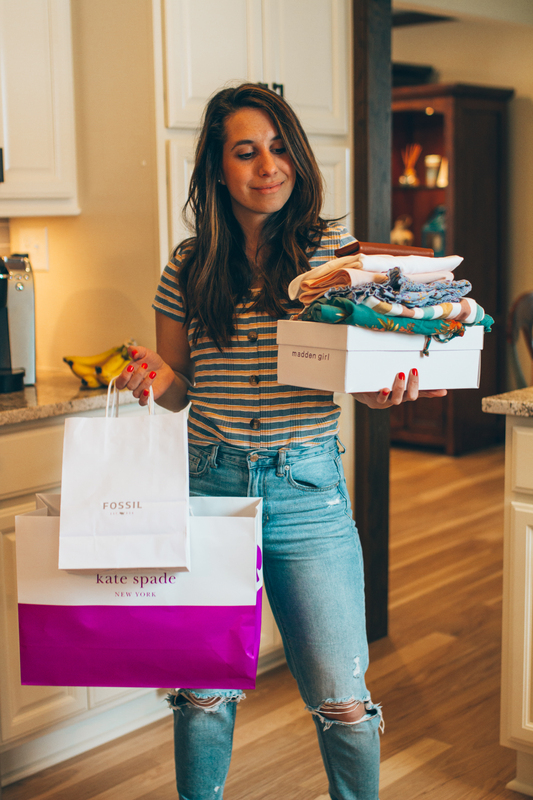 Through April 23rd, the Pleasant Prairie Premium Outlets is having a “Get Ready for Spring” event where you can find extra deals on top of regular sales on name brands such as Kate Spade New York, Levi’s, Pandora Outlet, and more! A lot of you watched my Instagram Stories and saw all the awesome things that I found. If you missed them, don’t worry, I will be sharing everything that I bought later in this post. If you haven’t been to an Outlet in a while, remember to wear something comfortable to do all the walking and expect to be there for at least a few hours. My first stop was Sunglass Hut. If I want to buy a pair of designer sunglasses that’s where I go. I found so many awesome deals throughout the store. Deals on Ray Bans (my favorite), Oakley, Prada, and more. I was tempted to buy the Ray Bans from the picture below, but since this was the first store I stopped at, I decided to wait until I was done shopping to see if I had money left from my shopping budget. GAP is another must stop for me. Every time I go to GAP I find staple pieces for my wardrobe such as tank tops and workout pants. I bought two versatile tanks in two different colors (white and pink) that I can wear with jeans and shorts this season. They were less than $10 which is a great deal! I also bought a few pairs of shorts and a polo shirt for my hubby. I always find great men’s clothes there. One store that has become one of my favorites is American Eagle. Two of the mom-jeans that I wear all the time are from that AE. I like the price point of their clothes and they seem to last for a while. I found a ton of cute things at American Eagle, I wish I could have bought everything! I shared on Stories the two pairs of shorts that I bought. They are so flattering and cute for running errands, brunching with friends, or for a boating day. I was desperately in need of a new wallet, so I went to Fossil with the hope of finding the perfect one for me. I found this brown leather wallet that is not too small nor too big. Just the right size to fit in my small purses. I never shopped at Journeys before but I went into the store to see what they had. When I saw those super cute espadrille platforms, I immediately asked the sales associate if they had my size in stock. They didn’t have my size but, luckily, size 7 fit me. I’m normally a size 7.5. Those shoes in trend right now and I can’t wait to wear them when the weather gets warmer. Journeys also have Birkenstocks, Sperry, New Balance sneakers and more. Their sales were pretty good as well. Pandora had great sales as well. They had pieces from past seasons making them pretty reasonable. I didn’t buy anything this time, but I always like going inside to check out their jewelry. Can we now talk about Kate Spade New York? They probably had the best deals. Some of their handbags were 60% off plus you would get another 20% on top of that. The original price tags were very high, but with the discounts, they came down to be pretty affordable for a high-end brand. Their handbags and backpacks were just gorgeous! I already told my husband that I am going back to the outlet before Summer starts! I found so many great deals and cute things that it was totally worth the hour drive! Make sure to go to Pleasant Praire Premium Outlets of Kenosha before their Spring event ends! **This post was in collaboration with Pleasant Praire Premium Outlet. All opinions are my own. Preciso de um óculos novo, adorei a dica! Gostei do seu shorts. Ficou ótimo em você. Obrigada pelas dicas do outlet. Quando estiver em Chicago, com certeza irei lá. Que bom que gostou!! Tem que ir sim! Muito boa essa outlet!